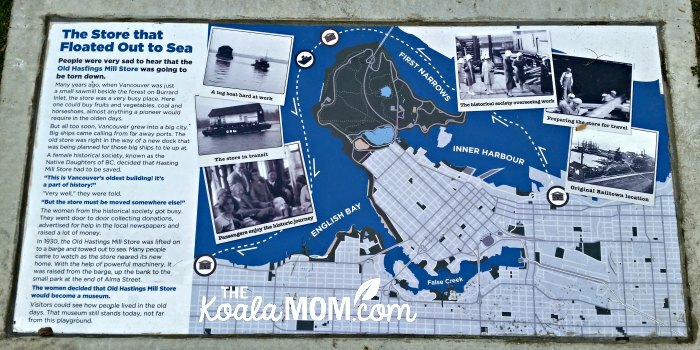 When we were invited for brunch at the Blenheim Pub, I thought it would be a great opportunity to explore Kitsilano. We’ve heard great things about the beach there since moving to Vancouver. However, waking up to a rainy Sunday morning quickly changed our plans. As we drove across town to the Blenheim, I began googling rainy day options in the area. Thus, after brunch, we found ourselves touring the Old Hastings Mill Store Museum and then walking Jericho Beach. Vancouver’s oldest building has a long and colourful history. This little yellow store survived the Great Fire 1886 and then was slated for demolition in 1929. The local historical society decided it contained too much history to destroy. Donations to a building fund helped float the old building down the river to its present location near Jericho Beach, just around the corner from the Blenheim Pub. Inside, the museum is treasury of Vancouver history. Most of the artifacts are behind glass displays in a big main room, which made it easy to let the girls wander and look. I enjoyed seeing what caught their attention or what comments they made about various items. One collection that caught my eye was the historical Vancouver papers. 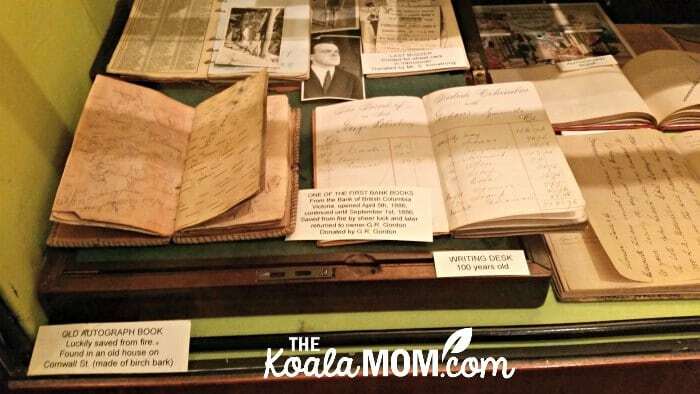 Beside a 100-year-old writing desk and a bank book from 1886 sat an autograph book made out of birch bark. Photographs and old letters were also preserved here. I find documents like this fascinating, especially when I consider what relics like this I might leave behind for someone to discover in 100 years. The girls loved the old dresses in the museum. I also enjoyed seeing the fashions of past days and reading the stories behind the beautiful gowns on mannequins. The wedding dress made me think of my grandmother’s wedding dress, which has been donated to her local museum (along with her sister-in-law’s). This dress, from World War II, had apparently been remade from a previous dress and displays a narrower, shorter style necessitated by the shortages of the war. I also enjoyed looking at the collection of historical cameras. I’ve always been interested in photographry and recently got a Nikon DSLR, which I am attempting to learn how to use. (Unfortunately, I couldn’t use it at the museum because my husband plugged the battery in to charge and forgot to tell me—so I had the camera with me, but no battery!) I don’t totally understand how these cameras worked, but the photographs captured by the men and women who used them also fascinate me. The Old Hastings Mill Store Museum also had a huge collection of First Nations memorabilia, including many baskets. In one corner sits a hansom cab, enchanting one’s imagination with the idea of riding it through the streets of Vancouver. (It’s easy to picture it bouncing over the narrow cobblestones of Gastown, actually.) 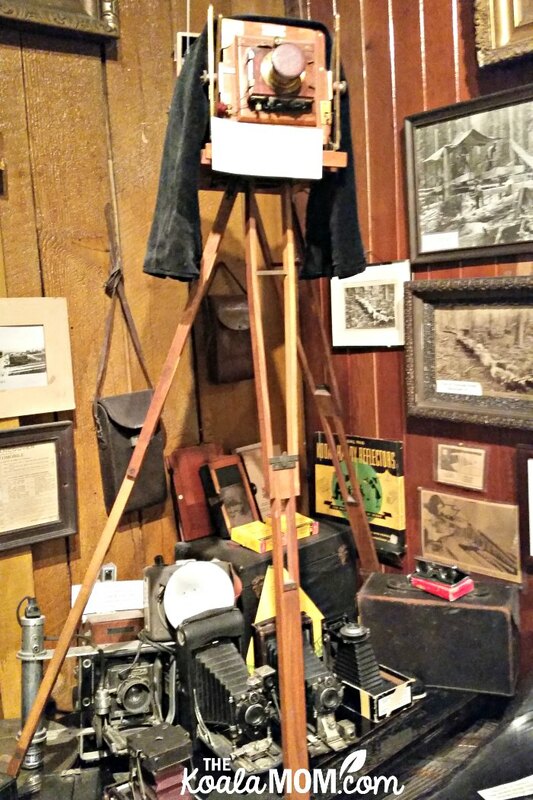 Other neat items included collections of World War II dolls, a few washing machines, snowhoes, and more. We spent about an hour wandering around the museum. There’s actually a lot to see packed into this small area. The staff were friendly and helpful, especially to a large family of small children! The girls enjoyed asking questions and hearing stories. If you’re in the area, I recommend dropping by. Entrance to the museum is by donation. Hours change between the summer and the off-season, so check the website to plan your visit. The Old Hastings Mill Store Museum now sits in the Hastings Mill Park at the end of Jericho Beach. 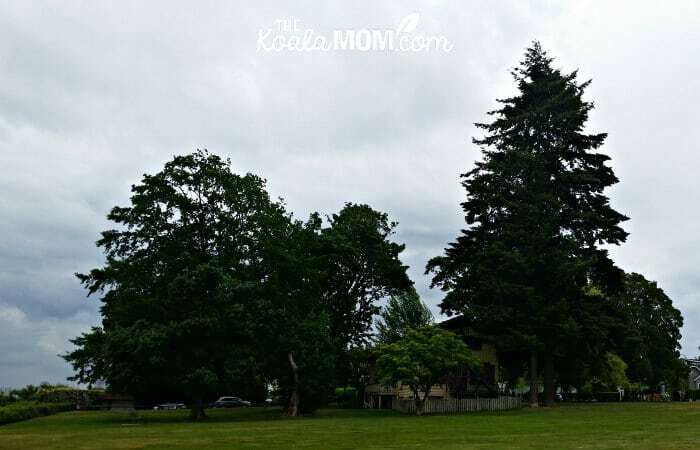 There’s a large green space here, a few picnic tables, and lovely views of the ocean. At the opposite end of the park from the museum is a new children’s playground, complete with swings, climbing structure, and sand box. When we got out of the museum, the clouds were still hanging low but the rain had stopped. The girls were soon having fun on the climbing structure and swings. I wandered the park, admiring the view. From Hastings Mill Park, we walked past the Royal Jericho Yacht Club and the Jericho Tennis Club to Jericho Beach. This city park is popular with dog walkers and cyclists. Canada Geese wandered the wide open green spaces, while driftwood logs dotted the sandy beach. Out on the water, white sailboats cut back and forth among black-and-red tankers. 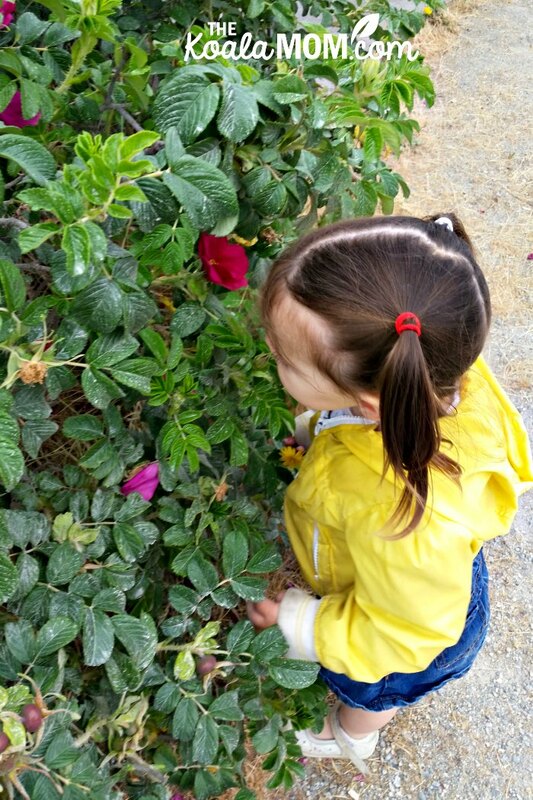 Sunshine, Lily and Jade were soon running ahead to climb on the rocks and driftwood edging the beach, while Pearl took time to smell the flowers. 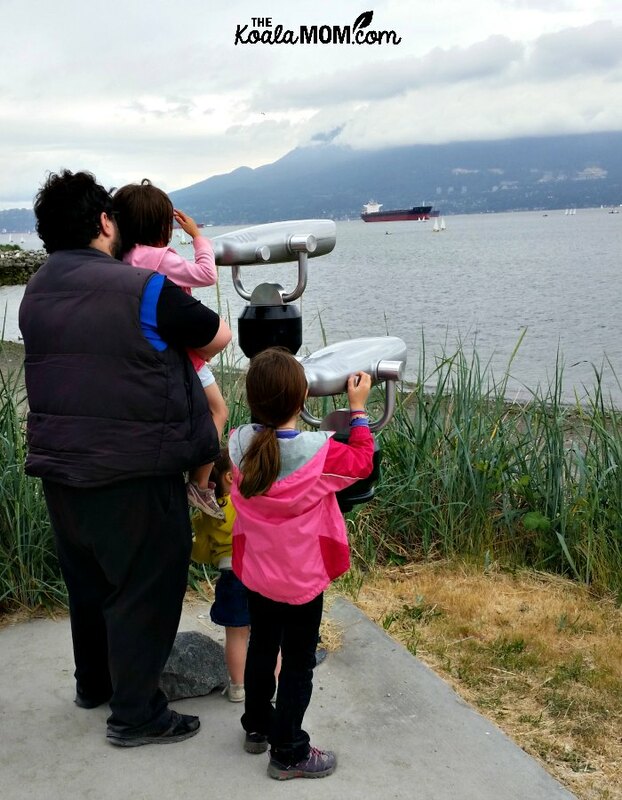 At a beach point, we found a pair of binoculars or viewfinders. The girls tried playing eye spy across the water, but the binoculars were hard to use. We were going to turn around there and walk back to the beach to play (having seen the view), until someone needed the washroom. This necessitated a dash onwards to the Jericho Beach Community Centre. The community centre is a busy place for water activities. Aside from washrooms, it also offers a cafe (if you need a snack or a hot or cold drink) and water sports rentals. As we walked up, the girls had fun watching the stand up paddle boarders, wind surfers, and kayakers setting out from the beach. Despite the cool weather, this part of the beach was crowded. When we emerged from the Community Centre, we discovered that it had started raining. Instead of taking the beach path back, we took the trail through the centre of the park. The girls were soon running ahead again. 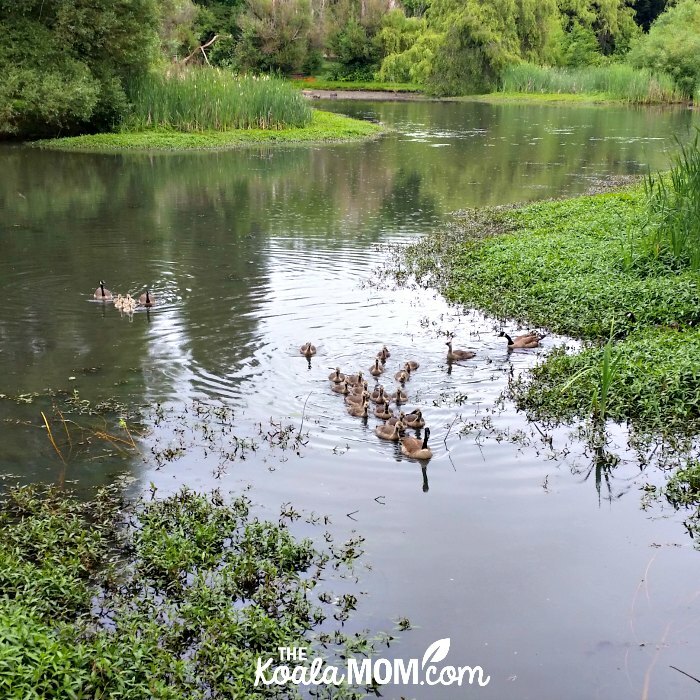 At a bridge over the lake, we spotted several families of ducks and geese. Finally, we made it back to the van. 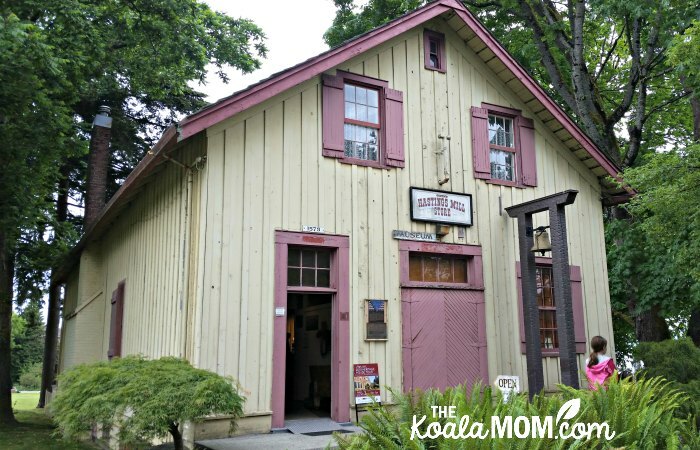 While the rain had changed our plans for the day, we still had fun exploring the Old Hastings Mill Store Museum and Jericho Beach. 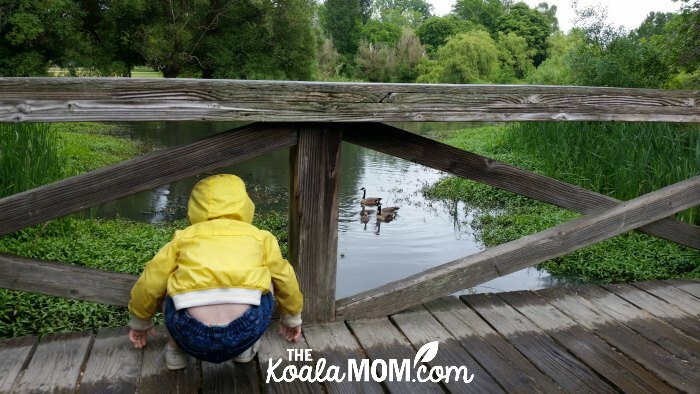 Ducks and geese don’t mind the rain, and neither do toddlers, really. We’re looking forward to exploring this area another day. 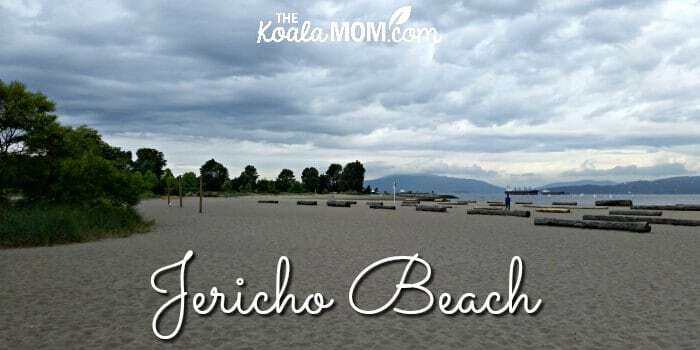 What’s your favourite thing to do at Jericho Beach? Have you visited the Old Hastings Mill Store Museum?